Make Ceremony Matter More is a podcast radio program about unique end-of-life ceremonies. 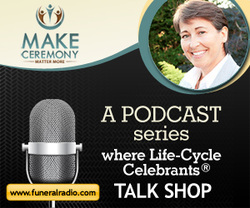 As the founding host, I interviewed Life-Cycle Celebrants about how they create a distinctive outcome for those families seeking a personalized end-of-life ceremony. The interviews are heartwarming as the Celebrants share their experiences. They portray how end-of-life ceremonies can be touching and memorable. You may find the interviews will make you smile, they may even make tears come to your eyes and they will likely make you think of even more possibilities for unique end-of-life ceremonies. Each podcast is 15 minutes in length and can be reached over the internet.